I really have a foil print obsession this year! It's not the first time I've posted about foil print pieces with shorts! I'm loving the trend, it's been around for a couple years here in Australia and you see it a lot on cute knits for winter. Being in Brisbane, I don't need a lot of winter knits, so I've been snapping up foil print tees too. Below I'm wearing two of my polka dot foil print pieces, with shorts because the first few weeks of autumn in Brisbane were quite warm. I bought this top back in February when it started getting a little cooler, Then the heatwaves hit and continued into autumn, and weeks later I'm finally giving it a wear! Being completely honest, while it was nice and cool in the morning, in typical Brisbane style it was hot and sunny in the afternoon and I ended up taking this off! It was nice to wear it for a little bit though, and take it off to just wear a tee when it got too warm. I'm looking forward to wearing it more, probably will be winter before I get a chance to! The knit top and denim shorts combo is actually something that came up from the monthly purchase video I did - I bought both of these in the same month (although the shorts have been worn a lot more!) and so I modelled them together for the video. I really liked the combination, so it seemed like the perfect outfit for the first wearing of this beautiful knit. 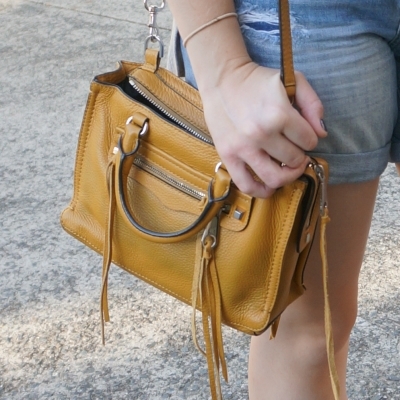 Decided to add just a little colour with the mustard yellow Micro Regan bag - I like grey and mustard together so I'm sure I'll wear this combination more often. Last worn: boyfriend denim shorts, Havaianas, Rebecca Minkoff micro Regan. First time I've worn the knit jumper as it's a recent purchase. Other ways to wear: boyfriend denim shorts and kimono, Rebecca Minkoff micro Regan and little black dress. It's been a while since I last wore these pink shorts, so they were due another wear! I seem to have the worst track record with keeping them clean, always spilling something on them. I'd been thinking about upgrading my denim jacket and buying a white one, but my inability to keep these pastel pink shorts clean is putting me off, haha! Thankfully they were spill free this time. Just a casual outfit to do the daycare drop off / pick up and work from home with a specialist appointment to take my son to in the afternoon. I like pink and blue together so the navy polka dot foil tee worked perfectly with the pastel pink. The aquamarine mini MAC was another nice little touch of colour. Although the foil polka dots are gold and the chain hardware is silver I think that they looked okay together, especially with the turquoise stone in the necklace. Last worn: polka dot tee, pink shorts, studded sandals, Rebecca Minkoff mini MAC. Other ways to wear: polka dot tee and floral kimono, pink shorts and denim jacket, studded sandals and a swing dress, Rebecca Minkoff mini MAC and maxi dress. Foil printed pieces add a little extra sparkle to a classic shorts outfit and is a nice way to make a casual outfit feel a little dressier. There are so many different foil print tops around, it's easy to find one that works for you, from a tee for warmer weather or a knit for colder weather. If you want to make your stay at home mum outfits feel a little more pulled together, wearing tops with extra details like foil print is an easy way to do so. Linking up with Fashion Files, Fun Fashion, Flashback Fashion, Weekend Wear. How cute the foil print polka dots look though!! I can see why are you obsessed with them, I mean what's there to not like after all haha, it's just so pretty! You look adorable as always! 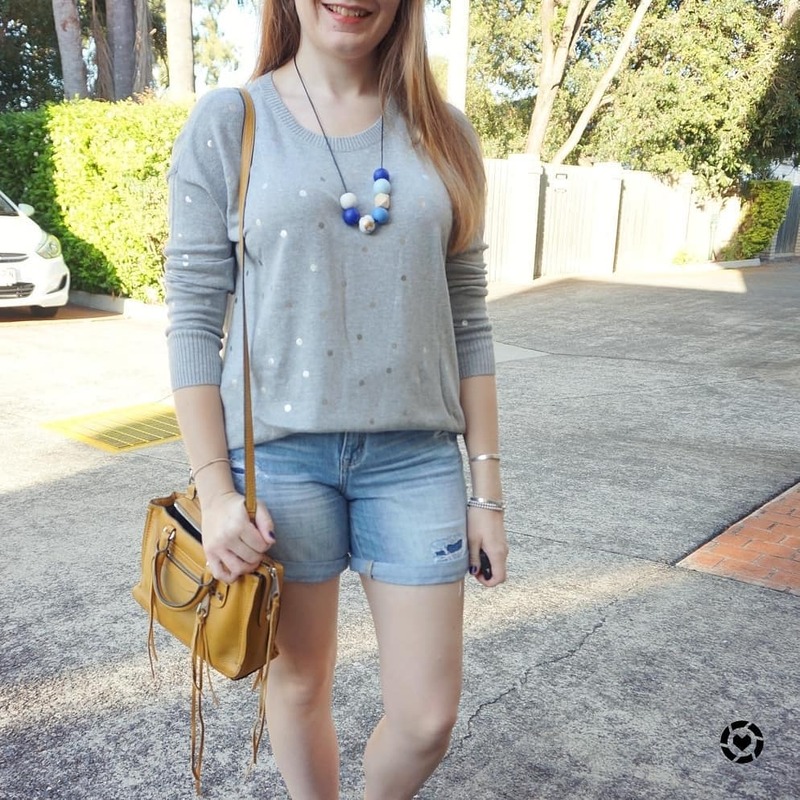 I love how you added pop of colors with your necklace in the first outfit with grey jumper! The bags looks great too! It's like that here where it's really cool in the mornings, and then warms up. It's almost like you need two outfits for the day (which would help my buy to wear ratio of clothes if I totally switched outfits...ha ha). 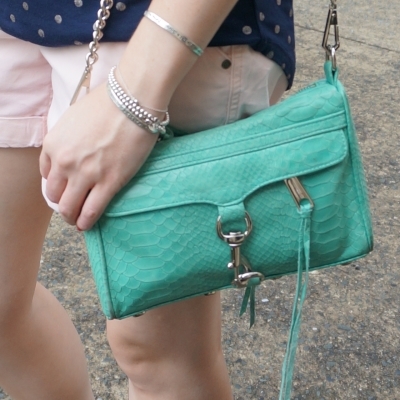 I love how your purses in these outfits really pop with color Mica!! We had the craziest winds yesterday---it even blew off parts of a roof downtown at the opera house.....eeeek!! hehe yes you need to layer in those in-between seasons, it is like two outfits in one! Both of these tops are so cute! I think this time of year we might be experiencing some weather overlap for once instead of being in opposite seasons! Our weather is warming up and yours is cooling down so we're meeting in the middle! Ha! haha yes we are definitely going to overlap there! I'm loving your sweater. BTW a lot of your links aren't working in this post. Oh that's frustrating! Maybe a glitch, as I checked and they are all working now without changing anything. I love the foil polka dots too! It's such a fun update to a classic style! I so love foiled pieces too and polka dot is my favorite print! Love both looks, as per usual! These are two great foil element tops, have you considered wearing them together ? As the sweater wrapped around your waist or shoulders ? I'm digging the polka dots! The foil does add just a little something special to the polka dots! Glad you are finally enjoying some cooler weather! I'm totally into polka dots too lately. I love how you styled your look, very pretty! I really love the foil pullover you're wearing in the first pic Mica! This looks like such versatile knitwear to transcend the seasons! That was the intention when I bought it, but it's been so warm I haven't had much opportunity to, haha! I love your way of embracing the polka dot print trend! These are two really great casual looks for Spring - and so versatile too :) Hope you're having a lovely week so far! This is such a pretty outfit. I feel like polka dots don't get enough attention, it's such an understated pattern but so gorgeous and versatile to style. The tops are so cute. I love the polka dots. That navy blue top really sings! Lovely. They really are, especially for me, haha! I'm so clumsy! I am seeing a comeback trend for polka dots and I'm lovin all your shirts Mika. I just love your taste in bags! Honestly love seeing your posts <3 cause such pretty bags! Such a cute trend! I love the foil and how you can dress them up or down with the metallic! 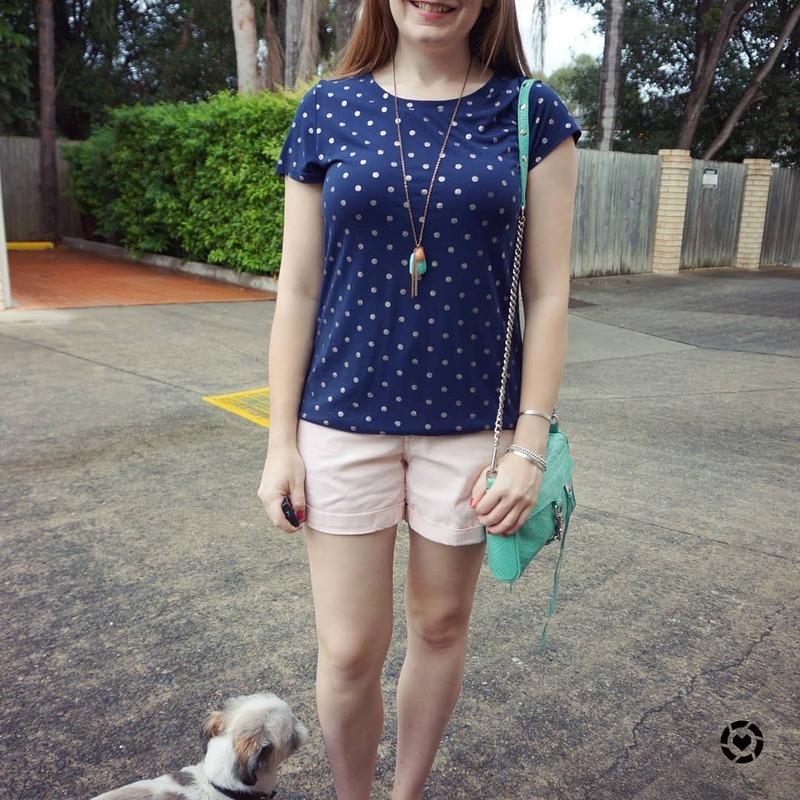 I do love polka dot tees! And yes foil print is becoming so trendy this season. I do get the hassle with ligh pink clothes! I have the same issue whether it’s shorts or dresses! I don’t even know when and it’s covered in stains! haha yes, light fabrics just attract stains when I wear them! I almost completely stopped wearing white or other light colors a while ago, if I don't spill anything not them the kids will surely do! Yes, between myself and the kids light colours don't last long! While we are heading towards summer, here in Europe, you approach winter over there! Love the polka dots and your looks are great! I love gray and yellow (mustards) together, too! That is the color scheme in our master bedroom. That foil polka dotted top is so cute! I love both of the bags!! Hope you are doing well, it's good to drop by your blog again!! I have always been a fan of polkadots. I love this metallic foil added to this wonderful trend. What a great look with shorts and of course your fabulous handbags. Have a happy weekend ahead ! Lovely and simple outfits dear! Love how you used simple and subtle accessories too, it adds such a cute character to the whole look! polka dots are such a sweet print! I love both of these outfits. You always look so fresh and pretty dear. You really do always have the coolest t-shirts! Very cute! I like the prints on them! I have always loved a foil print and remember being devastated in the early 00s when my favourite hot pink tee with foil dragon was destroyed in the wash and all the foil came off! I think the technology must have improved since and hurray for that. I'll be keeping an eye out for more foil knits this year as well. I am so careful to handwash everything foil just in case! :) I hope these last a while as I've been buying them up! I'm a huge fan of foil & metallic makeup, so I love this! HaHaHa Both tops are beautiful on you Mica.